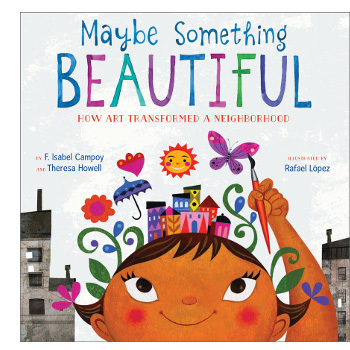 This morning over at Kirkus, I write about three new engaging picture books for the preschool set. That is here. Last week, I wrote here about Bethan Woollvin’s Little Red (Peachtree, April 2016), and I’m following up today with some spreads from the book. Over at Kirkus today, I talk to author-illustrator Helen Borten, pictured here, who left children’s literature in the early 1970s to launch an award-winning career in broadcast journalism and producing. 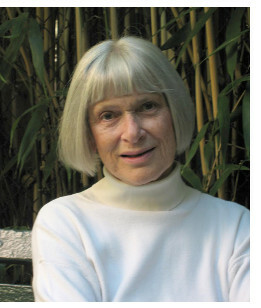 Thanks to Flying Eye Books, her picture books will be reprinted, the first in a series, next month. Photo of Helen Borten used by permission of Flying Eye Books. 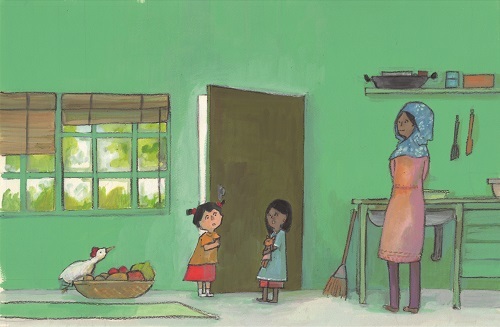 I’ve got a tiny peek today inside Kaori Takahashi’s Knock! Knock!, published by Tara Books this month and with text from Gita Wolf. Tiny, as in just two little illustrations, but if you want more information, you can head over to my BookPage review of the book. As you’ll read there, this is a story that quite literally unfolds (clear some space when you read it) to tell the story of a young girl in search of her toy bear. — From What Does It Mean to Be an Entrepreneur? Today over at Kirkus, I write about Bethan Woollvin’s debut picture book, Little Red (Peachtree, April 2016). That is here, and next week I’ll have some art from it here at 7-Imp. 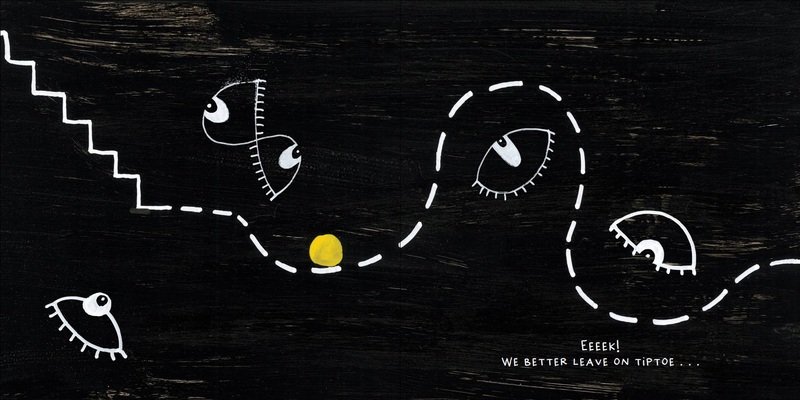 Last week at Kirkus, I talked here to Emma D. Dryden, and I wrote here about Bob Raczka’s new poetry collection. 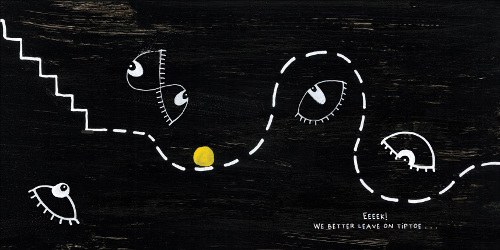 In this follow-up post today, I have some images from Bob’s Wet Cement: A Mix of Concrete Poems (Roaring Brook, March 2016), and some of Ken Min’s illustrations from Rana DiOrio’s and Emma’s What Does It Mean to Be an Entrepreneur? (Little Pickle Press, January 2016). 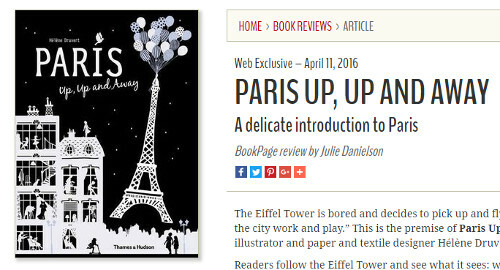 Over at BookPage, I’ve got a review of Paris Up, Up and Away (Thames & Hudson, April 2016) from French illustrator and paper and textile designer Hélène Druvert. I’ve got a review here over at BookPage of Bill Martin Jr and Michael Sampson’s Listen to Our World (Paula Wiseman Books, March 2016), illustrated by Melissa Sweet. As a follow-up today, Melissa shares some art — as well as a few early sketches. “I wonder how fast the wind blows. I wish I had a ship with big propellers that would spin stronger winds to drive the storm away. The ship sails into the black clouds. Hi, dear kickers! I’m back from my research trip and happy to be kickin’ again. 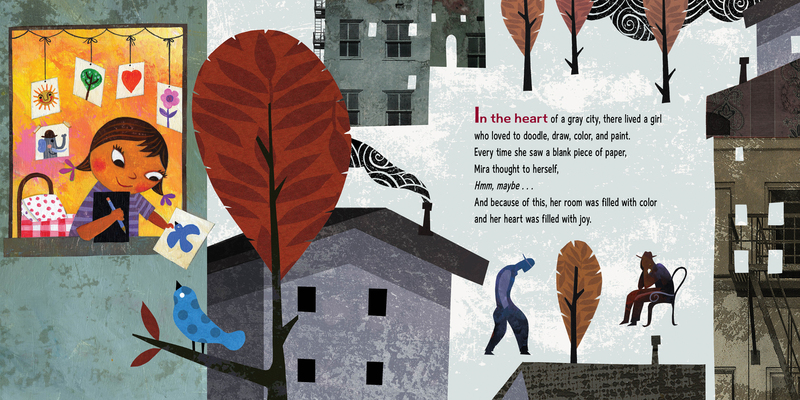 I write weekly columns for Kirkus, and when I write about picture books over there, I always like to follow up later, here at 7-Imp, with art from the books I write about. That’s on account of being a big illustration fan. I don’t normally do that on Sundays, but I’m a bit behind from being out of town. All that’s to say that a couple of weeks ago, I wrote here about Akiko Miyakoshi’s The Storm (Kids Can Press, April 2016), and so today I’m sharing some art from the book. 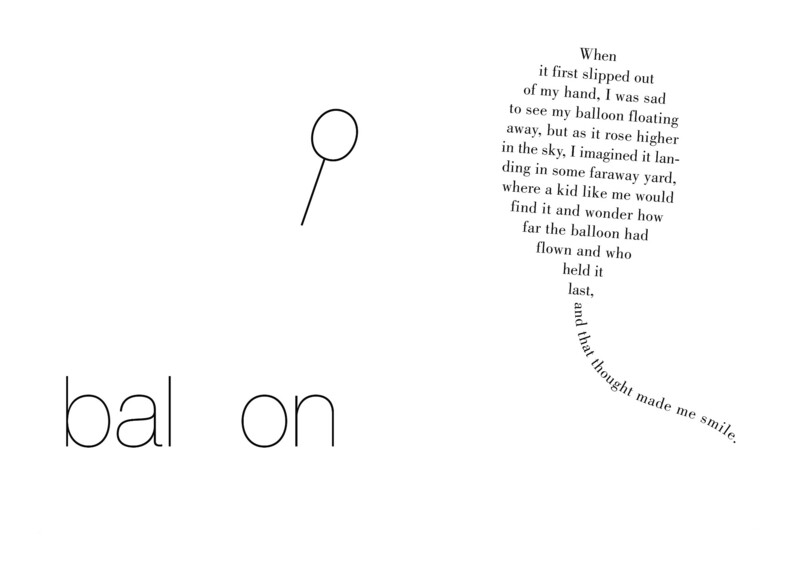 In honor of National Poetry Month, I have my favorite new poetry title over at Kirkus today. That is here. At the end of March, I talked here with Hervé Tullet over at Kirkus, and I’m just now (because I was out of town last week) following up with some art from his latest book, Let’s Play! 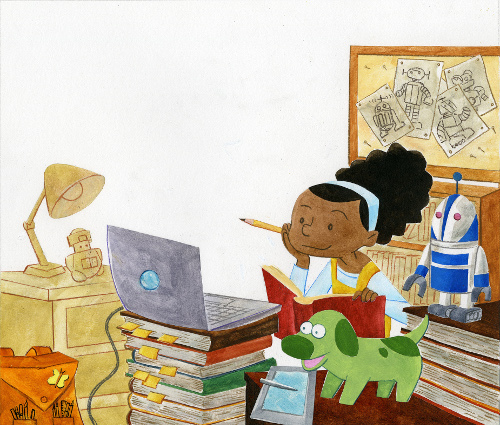 Today over at Kirkus, I’ve got a Q&A with former Simon & Schuster editor Emma D. Dryden, who now runs her own editorial consulting firm and who talks to me about her new picture book. That chat is here. 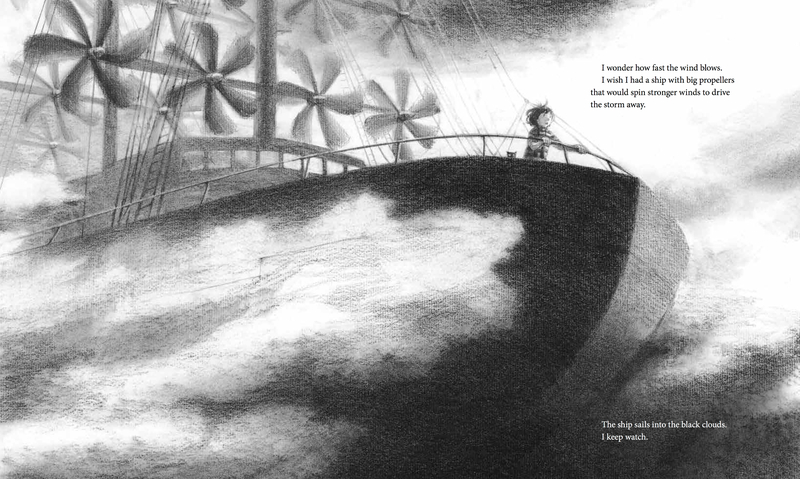 Last week at Chapter 16, I talked to author and illustrator William Joyce about his new children’s novel. That conversation is here, or you can click the image above.